The Zelite Infinity Executive Chefs Knife is a top of the line chef knife in all areas. Every part of this chef knife, from the sheath to the handle, to the blade, personifies craftsmanship. The blade looks the part of a top of the line chefs knife and performs even better. The blade depth – 57mm – gives this chef knife added heft, pairing Japanese steel and design with a German feel. The added clearance can also save you some wear and tear on your knuckles and is beneficial for the ‘rocking motion’ style of cutting. The best chef knives have durable, comfortable and secure handles, and the Zelite Infinity Executive Chefs Knife is no different. The full tang is supported by a black handle, with three rivets. The handle is rounded and ergonomic, making it suitable for long shifts in the kitchen. Infinity vs Executive, which is better and which is best for your kitchen? The blade is extremely sharp and crafted to hold it’s edge. A traditional, hand sharpening method is used to create a 12-degree edge, virtually unheard of in Western knives. The blade scores a 61 Rockwell Hardness rating, meaning this blade is very hard and will retain its sharpness well. The blade is deeper than your average chefs knife, which makes this blade ideal for heavy duty chopping. The increased clearance helps facilitate the ‘rocking-motion,’ one of the three major cutting motions. The handle is solid but comfortable. It’s well balanced, which is important for a blade of this size and sharpness. The tapered bolster creates a handle that fits perfectly in your hand. This quality becomes even more important for those using this knife in a commercial kitchen. Because this is one of the best chef knives, it’s also one of the most expensive. It can retail for more than double some of the other chef knives covered in our reviews. This is not a ‘forgiving’ chefs knife. Meaning, this blade is very, very sharp, and beginner chefs must use caution because this blade can cut you much easier than less expensive models. The Zelite Infinity Executive Chefs Knife is one of the best chef knives because of it’s exceptional craftsmanship and top-of-the-line materials used. The balanced, comfortable, triple-riveted handle make this a true chef’s knife, matching high performance with impressive visual design. All told, this is a knife that can handle the rigors of a commercial kitchen, and look good while doing it. So, just how good are the Zelite Japanese knives? Take a look at this great review of the entire range. 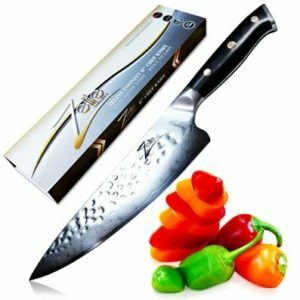 Zelite Infinity Executive Chefs Knife – This model is more expensive than the top ranked knife on our list, although they are relatively similar in features. They both use the same high-quality Japanese steel with a wonderful, durable handle. The Zelite Infinity Executive Chefs Knife stands out because of it’s deep knuckle clearing, which is ideal for heavy duty food prep.